Steven Wright, the comedian, helps Louis CK write his TV shows. He’s the ONLY person Louis CK trusts to help him. Yesterday I read that Steven Wright has read everything Kurt Vonnegut has ever written. I’ve been on a Kurt Vonnegut binge. I just finished reading five of his novels and a biography. So once again I am indirectly connected to Louis CK. We’re like blood brothers. Kurt Vonnegut has written almost 20 bestselling books. His book “Cat’s Cradle” is required reading in almost every high school. I love him. But… he was a total failure. By 1968, after 20 years of writing, all of his books were out of print. He was broke. Nobody had ever heard of him. Nobody cared. His career was over. Some of those books later became massive bestsellers: Cat’s Cradle, The Sirens of Titan, Mother Night, and so on. I was talking to Casey Neistat yesterday who has hundreds of millions of YouTube views. He wanted to be a filmmaker. Would he have made it in Hollywood? He said, “I make sure every 1/24 of a second in every video moves the story forward. Casey isn’t stopped by gatekeepers. He makes a video every day and uploads it. 500,000 people a day watch his videos. Sh*t. I care. I care too much. I hide under my pillows caring. I know I shouldn’t care. Claudia hates that I care. Sometimes I feel like a little child around all of these people I admire. When I left Casey’s studio, I dropped all my equipment. I forgot my phone. He had to run after me. I care so much I get nervous. Kurt Vonnegut had gatekeepers. He was dependent on publishers and bookstores. Finally he published a book that was acceptable to both (Slaughterhouse Five) and all of his books started coming back in print and bit by bit, he became one of the bestselling authors ever. For Kurt Vonnegut, he was dramatically effected by the firebombing of Dresden, Germany, where he was a prisoner of war. 130,000 people died in a single day. Compared with 90,000 in Hiroshima. Kurt Vonnegut survived and his job after that was to dig up all the bodies. When he ANCHORS a book (in Slaughterhouse Five, for instance, he anchors to the most horrific moment of his life – Dresden), he can go CRAZY after that: time travel, other planets, placing the author as a side character in the book, all sorts of experimentation. It doesn’t matter because he can always pull back to the emotional anchor when he needs to. And then we all relate. No emotional anchor = no art. No meaning. Another example: Harry Potter. The emotional anchor: an orphan, mistreated by step-parents, wants to feel special. The craziness: Off to wizard’s school to fight bad magic everywhere! Another example: Carrie. Social outcast girl with overly religious and strict mother. Craziness: Rains blood on everyone at the prom. None of these writers use fancy language. They get their emotional anchor. Then they go crazy. They are not “trained” writers. They write. I get scared sometimes. I feel my emotional anchor is how I lost my money in 2001-2 and then made it back. Blah blah blah I was suicidal. Blah blah write ten ideas a day. Be grateful. There’s only so many times I can write about that. Too many times and it becomes boring. Every single day, art and innovation are right outside the emotional prison of your comfort zone. When Vonnegut left out his emotional anchor, I think his writing started to decline. He tried to cater to an audience instead of focusing on what was right outside his comfort zone and continuing to explore. What are your emotional anchors? The events that staple the timeline of your life to something that totally destroyed who you thought you were? They can be small moments or big moments. These are the moments where you choose yourself. 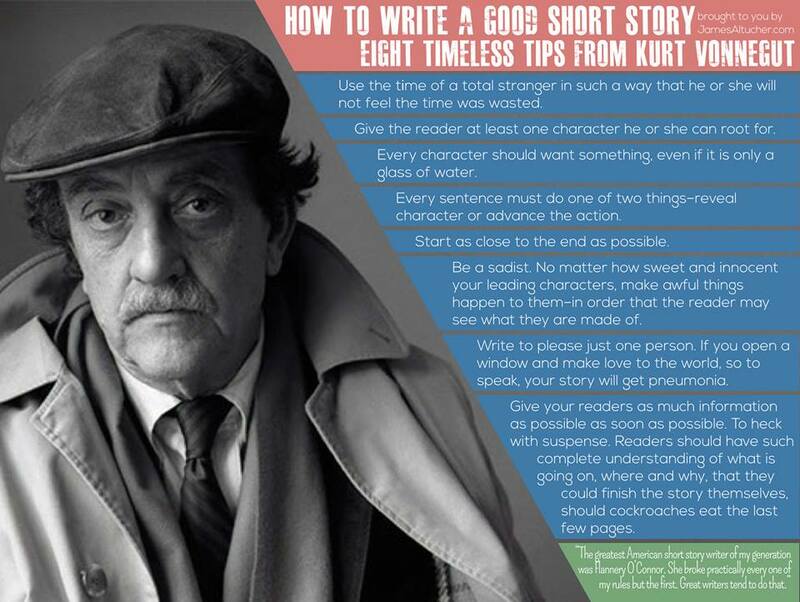 Vonnegut’s critical tips on writing are a must-read for anybody who wants to create or innovate or explore. I hope when I grow up I can one day be as good as Casey, or Vonnegut, or Stephen Wright. (or, Shhh, Louis CK).